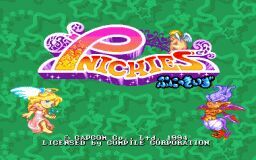 Pnickies is a Tetris-style puzzle game, where the objective is to match coloured balls of the same colour, causing them to disappear. Balls which are the same colour link together on contact to form large shapes, and must be carefully stacked to allow access to other colours. The playfield you can see consists of six columns twelves rows high. The thirteenth row which is not visible is also used for storing balls and is counted for scoring purposes. 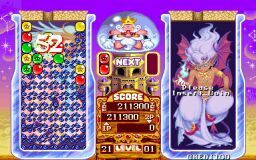 The balls drops from the top of the screen in linked pairs in the third column, and can be of two types, those with stars and plain. The plain ones simply connect with those of the same colour, but any single colour with two stars or more in it will cause the whole linked colour to disappear and award you points. Each pair of balls will consist of either two plain balls, or one plain and one with a star. 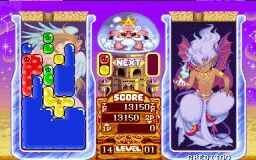 There are four primary colours of ball, which exist from the start of the game; red, green, yellow and blue. Later in the game you will also have to deal with cyan and purple coloured balls to complicate matters. 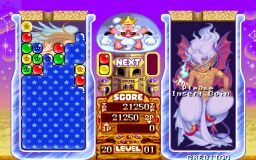 Scoring is based on the number of interconnected balls which consist of two or three stars when they disappear; the larger the set when it is activated, the more points you score. 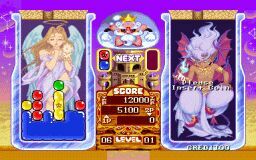 The game ends when either you reach level 100, or the third column is filled and there is no more space to drop balls into the playfield. As the game progresses you will usually notice one dominant colour appearing, and this should be the colour which you should try to connect most of together. When building a large set of a single colour, keep a close watch on star balls, and try to keep more than one out of the set for as long as possible. Only link in a second star ball when you have the single coloured set as large as possible. In theory the maximum linked set can be 78 balls, but in practise you should consider 72 as the maximum you could achieve. The invisible 13th row is very difficult to work, so the visible area is more of a priority. Any set over 50 is considered excellent, and in normal play 60 is outstanding. Use both buttons. Don't rotate 3 times when you can rotate once using the other button. It takes a while to get used to, but it definitely pays off. Decision time is the most important thing in Pnickies. By the time the next piece comes out, you should already know where you want to put it and also already know which keys to hit to get it there.